NetEase's interest in bringing the Playerunknown's Battlegrounds craze to mobile was not particularly surprising in itself. The PC game has been a smash hit in the West, but a reported 35 per cent of its player base are based in China. For a Chinese company with designs on a worldwide audience, like NetEase, the potential is clear. NetEase is also one of the few companies operating at a sufficient scale to facilitate a fast-follow – on mobile, no less – of a title as complex as PUBG. The surprising part, then, was its approach. It launched three distinct PUBG-like titles – Knives Out, Rules of Survival and Survivor Royale – over a short period of time. Even more puzzling was NetEase's decision to launch all three without any monetisation to speak of. The games, Rules of Survival and Knives Out especially, performed well. 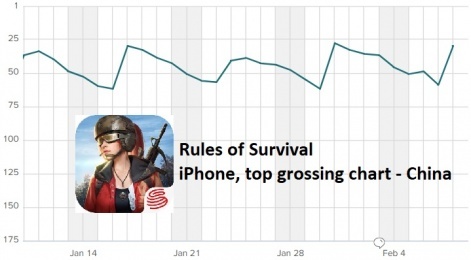 Rules of Survival even topped the US iPhone downloads chart. In its recent financial report, NetEase reported 100 million downloads for Knives Out and 80 million for Rules of Survival. But inevitably, all questions were surrounding exactly how and when NetEase intended to make money from them. NetEase has finally provided an answer, with in-app purchases being introduced to all three in recent updates, enabling users to buy in-game currency and buy packs containing items of clothing, for example. Its approach, it seems, was to build audiences before introducing monetisation to already-established communities. But has it worked out? Downloads-wise, Rules of Survival clearly outperformed NetEase's other battle royale games in the West. The same is proving to be the case since the introduction of IAPs, with the game quickly finding its footing in a consistent top 200 US iPhone grossing chart position, according to App Annie data. Its peak in the US iPhone grossing chart so far has been 69th, on January 13th 2018. It was ranked at 119th as of February 8th. Rules of Survival has also scored top 100 grossing positions in 80 other countries, including Australia, Russia, Spain, France and Canada. But it's performed very well in China, too, with consistent top 200 – and mostly top-100 – grossing positions in NetEase's home territory. As of February 8th, it sits at 30th in China's iPhone grossing charts. Knives Out, meanwhile, enjoyed its best download chart rankings in Asia. The game topped the iPhone downloads chart in China for a full week back in November and has also performed incredibly well in the country's grossing charts since the introduction of in-app purchases. 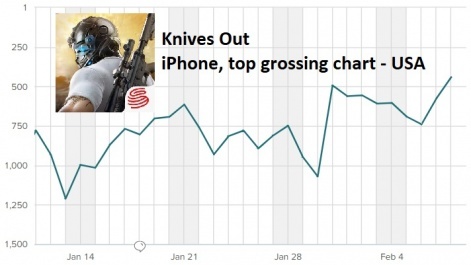 Proving the appetite for in-app purchases, Knives Out shot to fourth in China's iPhone grossing charts on the first day of their introduction. And while that's the highest it's reached so far, it's lowest grossing position has been 39th. As of February 8th, it's back in the top 10 at seventh. Elsewhere in Asia, Knives Out has peaked at 14th in Japan's iPhone grossing charts, also charting within the top 100 in Malaysia, Taiwan, Hong Kong, Vietnam, Thailand and the Philippines. In the US, meanwhile, Knives Out has been unable to compete with Rules of Survival. Its highest grossing position in the country has been 416th on December 21st 2017. It's remained for the most part a top 1,000 grosser, however, ranking at 442nd as of February 8th 2018. And just as examination of Survivor Royale's download chart rankings revealed it to be the runt of the litter, its early grossing ranks have done little to alter that perception. In the US, it has only registered on the iPhone top grossing chart for three days – its highest rank being 887th on January 13th 2018. NetEase's experiment with delayed integration of monetisation was successful. 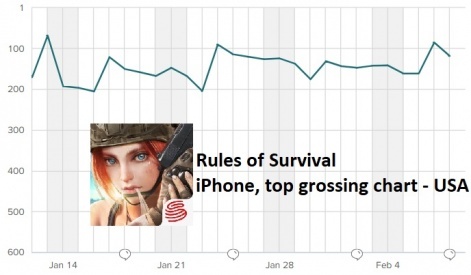 Elsewhere, it's peaked in the top 100 iPhone grossing charts in a mere nine countries – Ireland, Thailand and the Netherlands among them – and has failed to get anywhere near Rules of Survival and Knives Out. All in all, though, the results would appear to suggest that NetEase's experiment with delayed integration of monetisation was a successful one. With the launch of multiple games, it was able to see which territories preferred which titles – broadly speaking, Rules of Survival excelled in the West and Knives Out in Asia – and presumably tailor monetisation accordingly. But whether through calculated strategy or simple good fortune, NetEase has found itself with two major, seemingly complimentary hits on its hands. Perhaps more significantly, in a major bid to own the battle royale space on mobile, it's also beaten Tencent's official PUBG mobile games to market.